Our reverse osmosis systems remove fluoride, pharmaceuticals, chloride, and many other harmful contaminants. Flowing out of a designer faucet in your break room or wherever you please. The point-of-entry system will provide your team with the highest quality water, so they can be hydrated and energized to win the day. Kinetico designed this state-of-the-art reverse osmosis system to solve even the toughest water quality challenges. 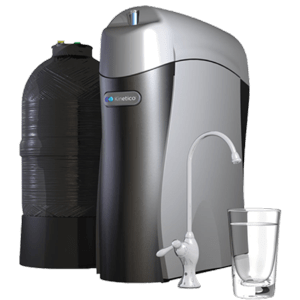 The K5 is smartly designed to be convenient and economical, provide an abundant supply of high-quality water, be easy to use and maintain, and provide the best-tasting water. When you own a K5, you know you are doing all you can to provide your family with the highest water quality at the best price. To learn more about this system watch this video. The K5 features QuickFlo® technology to deliver a strong, steady stream of high-quality water when you want it. Fact is, the K5 produces more water faster than any other comparable system so you won’t need to ration or wait for your water. The K5 significantly reduces more contaminants than any other drinking water treatment unit. You can customize the FlexFilters in your K5 according to the specific water challenges you’re facing now or that you may encounter in the future. Thanks to EverClean® Rinse, the K5 uses high quality water to clean itself which keeps the system in top working order and extends the membrane’s life. Additional features like the MACguard® Filter and PureMometer® Filter Life Indicator let you know when it’s time for filter changes and prevent you from pushing the filters past their capacities. Quick-disconnect filter cartridges make changing filters a snap. 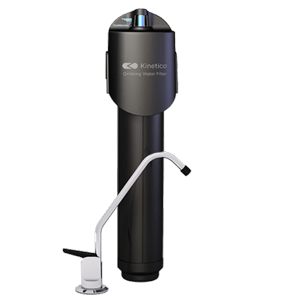 The AquaKinetic A200 Drinking Water System by Kinetico provides an excellent, economical way to improve the test and purity of your drinking water. 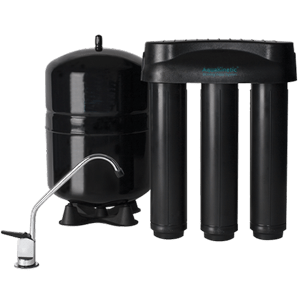 Its three-stage system, including a high-capacity prefilter, high- performance reverse osmosis membrane and carbon post filter, eliminate a variety of common contaminants from your drinking water. What you’re left with is clean, clear, refreshing water for all your drinking and cooking needs. The compact system can be installed under your sink, in a basement, utility room or garage- wherever is most convenient for you. The AquaKinetic A200 Drinking Water System is a great way to have an abundant supply of high quality and great-tasting water for drinking, cooking and other uses. Quick-disconnect filter changes are easy and sanitary. The reverse osmosis membrane produces higher quality water at a faster rate than competitive systems. The A200 offers a lead-free faucet to dispense its high-quality water. Drinking water is dispensed via a dedicated faucet at your sink. The MACguard® Filter is an excellent choice when you want to eliminate unpleasant tastes and odors while improving the quality of your water. The PureMometer® filter life indicator shows you how much your 500- gallon filter capacity remains. When a filter change is necessary, the system alerts you by reducing the flow of water from the faucet. The MACguard® Filter doesn’t take up precious counter or refrigerator space, or attach clumsily to your faucet. It fits and operates conveniently out of the way-under your sink or from some other location. Plus, it includes a dedicated, lead-free faucet for dispensing its refreshing filtered water. Changing the filter is quick, clean and easy with Kinetico’s unique design. Just a quick twist is all it takes to install a new filter.